We now know what films will be contending for this years Academy Awards. 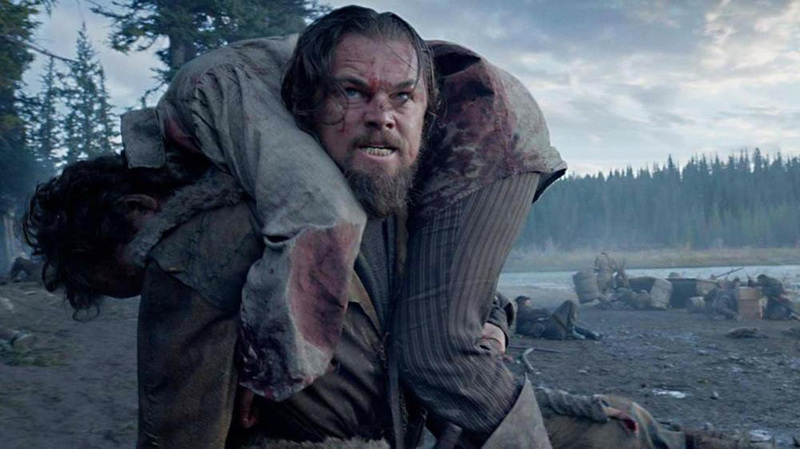 No film received more nominations than "The Revenant" with 12 overall. This includes nominations for Best Picture and Cinematography as well as actors Leonardo Di Caprio and Tom Hardy being nominated respectively for Best Actor and Supporting Actor. But would it all be justified? Does "The Revenant" deserve all the buzz it is getting recently? Will it finally be the Oscar win that Leo has had his sights on for many years? This is one of these films which makes me glad that I wasn't born during a certain time period! In 1823, frontiersman Hugh Glass (Leonardo Di Caprio) along with his son and fellow members of his hunting team face danger from the wilderness, animals and also other people. Whilst on an expedition, Glass is attacked by a bear and is left beaten to within an inch of his life. After being placed in the wrong hands whilst being taken care of, tragedy happens in front of Glass and he is left for dead by the abrasive and hunter John Fitzgerald (Tom Hardy). Fuelled by revenge, Glass must crawl, swim and hike to track Fitzgerald using only his survival skills as he looks for to get his own back. "The Revenant" is directed by Alejandro G. Inarritu and his second film nominated for an Oscar in the last two years- Birdman being his first. From "The Revenant" you can see some of his traits in full motion. There are many times with very long takes, with very little cuts throughout this film and none other better than the one at the start of the film. The settlement that Leonardo Di Caprios character suddenly is under attack after a hunt by Native Americans. Inarritu does a great take- similar to the one in Birdman where Micahel Keaton makes his way through the street- as the attack begins and it allows us to see in great detail what is going on. It is a truly great scene and also fairly gory too. There are a lot of very impressive parts of this film. One of the most talked about has been the scene featuring the bear. This is an unbelievable piece of film making. I am so interested to see how they pulled this off. How they were able to get this scene done is beyond me. The scene involving the bear features the beast attacking Glass and it is brutal. One of the best uses of CGI ever used. Credit goes to Leonardo Di Caprio for this as well as his acting is superb, reacting to every movement as if it is actually happening. A truly incredible scene. I think we have the winner for Best Cinematography in "The Revenant". The fact that the cinematographer Emmanuel Labezki spent a lot of time in the cold waters whilst shooting shows how much effort went into getting the best possible shots. The conditions wouldn't of made this easy at all and the results were excellent. "The Revenant" may very well win the Oscar for makeup for the talents used to create the wounds on Glass from the attack from the bear. Really disgusting and real looking at the highest standard. Also the shots of the landscapes that this film was filmed on are incredible. Some truly breathtaking sights and is phenomenal. As someone who has been choked with the cold lately, the filming of the landscapes in his didn't help as it really conveyed how cold it would of been. The film was also filmed just with natural lighting which is truly incredible. This meant that they would of had to have been very precise and do it very quickly as they would only have a certain amount of time to get the right shots. This may of been a pain for filming but it is great commitment. 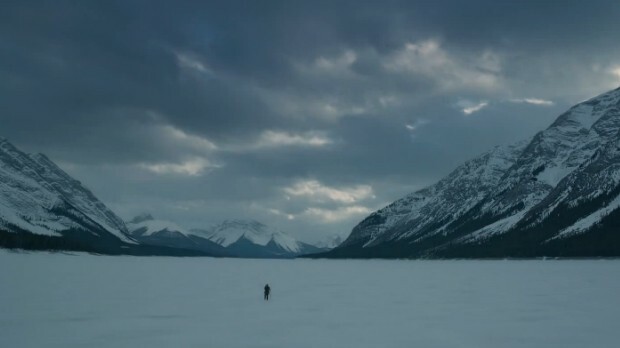 One of the great shots in "The Revenant"
A lot of buzz for this film has been about Leonardo Di Caprio and how this may finally be his triumph in the Oscars. Over the years he has been so close and seemed like a certainty to win it but was unsuccessful. 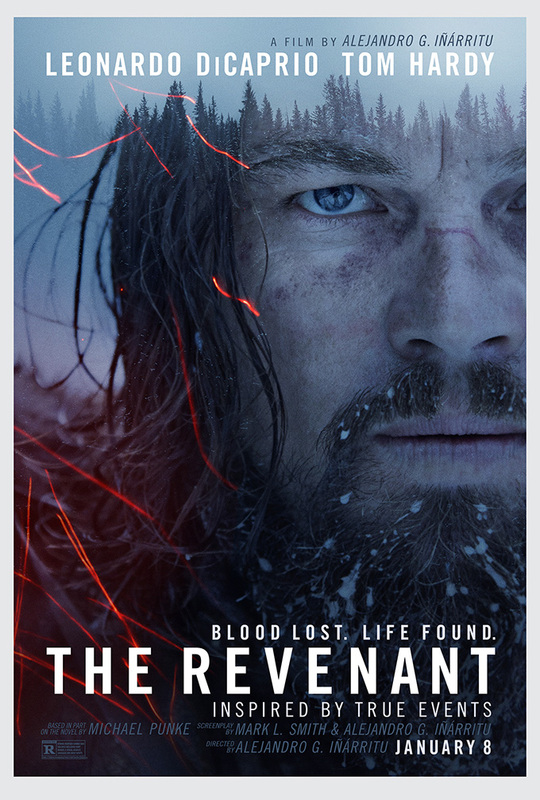 So will "The Revenant" break that for Leo? In my opinion.... It shouldn't. I really do admire the work of Di Caprio and you can't take away the gruelling and physical aspects of his acting in this movie. However I feel that there wasn't enough from him to win the Oscar compared to who he is up against. There wasn't a lot of great dialogue from him and it featured him mainly screaming at times. He was great in this film don't get me wrong but I don't believe that this is the time that he should win the Oscar. There is no doubt that he was good in this and that this would certainly of not been an easy film to be in. He would've went through a lot in this role and can only imagine how cold he must of been shooting most of this in freezing waters and snowy mountains. To make a good performance in these conditions is a credit to the man. Tom Hardy is also nominated for an Oscar in the category of Best Supporting Actor. He also gave a good performance in the tough conditions. Again, I am not particularly sure that he will win. This may be due to the great amount of competition that he has to contend with in his category. The film also featured a good performance from Will Poulter- most famous for "We're The Millers" and "The Maze Runner". This is the first time I have seen him in a film like this and I have to say that I was fairly impressed with him. He does great in the film as his character faces difficult decisions whilst accompanying Fitzgerald. Domhnall Gleeson is on a bit of a hot streak right now isn't he? He again had another strong performance after his recent successes in another supporting role. I did feel slightly underwhelmed at the ending of this film. I didn't feel that the pay off fitted the film and was slightly disappointed, However in saying this, the final confrontation between Glass and Fitzgerald is great but just the end lacked what I was hoping for. I feel that it kind of took away from the long, hard journey that was taken in this film. At times I was slightly confused by Glass' injuries. At times I feel that it lacked consistency such as when he wasn't able to walk but as soon as he was in water, he was swimming completely fine, kicking perfectly. The once he's on land, he goes back to really struggling. Overall a good film and deserving of many of the Oscars that it has been nominated for. I would definitely recommend seeing "The Revenant", there are a lot of great aspects in this film that you will get enjoyment out of. So "The Revenant" what did you think of it? What do you think it will pick up at the Oscars? Once again I hope you enjoyed reading my review and also, thank you for reading, it means a lot!